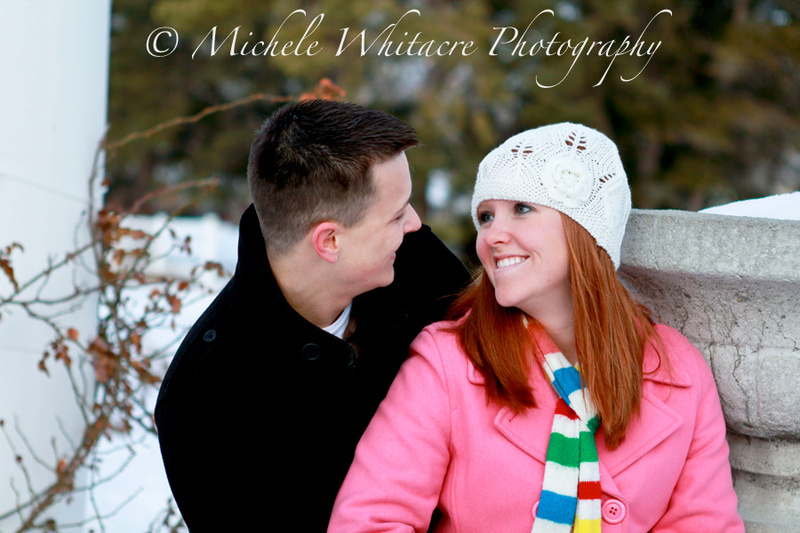 How about photos of the most ADORABLE couple ever, just in time for Valentine's Day? 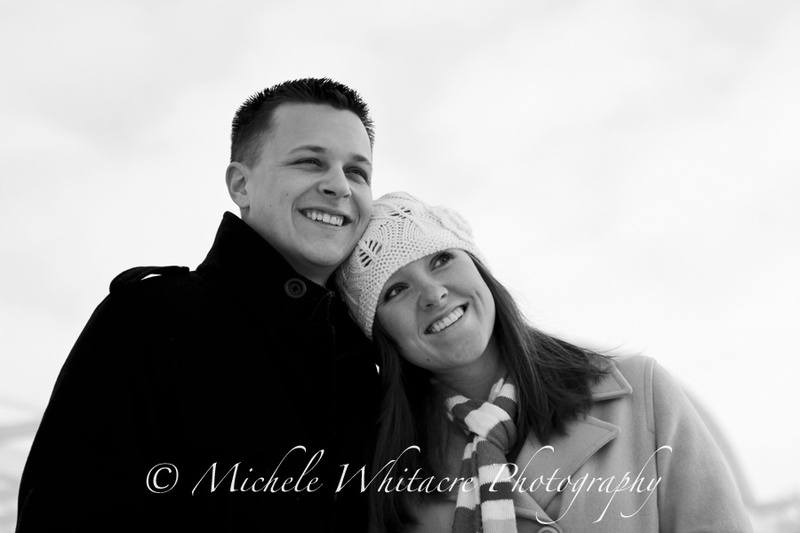 A few weeks ago, I asked for a couple to volunteer to brave the cold and snow to be subjects for a winter photo session and Alex and Olivia were brave enough to agree to a session with me. I warned them that they could expect to get cold and wet during the session, and I did not disappoint. By the time the photo shoot was over they had been sitting, laying, and tromping in the snow piles, but I think the end result is some pretty great photos. My awesome hubby, Kevin, was kind enough to tag along with us to the session to hold my camera bag and props for me, since I couldn't just sit them in the grass like I do during warm weather shoots. 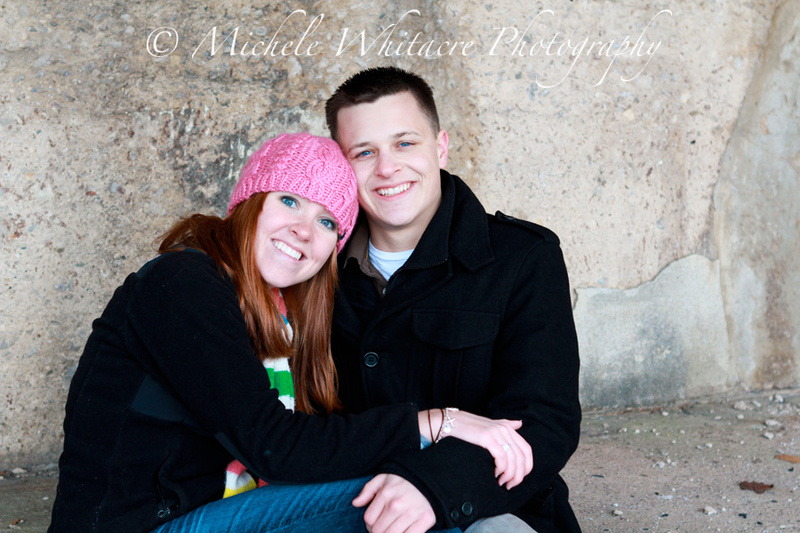 He was a real trooper, especially because our photo session got started bright and early at 8:00 AM! Kevin and Alex have been friends for a long time, and the two of them kept Olivia and I entertained during our ride between shoot locations with stories of their bike riding adventures from when they were kids. Alex and Olivia are both college students. Alex wants to be a dentist and Olivia wants to be a dental hygienist. Sounds like a match made in heaven to me! Both of these two were amazing to work with. They were so willing to try anything I suggested, and they were nothing but smiles the entire time. Thanks again for volunteering, and for being so accommodating to all of my crazy requests. You guys were awesome to photograph. I wish you both lots of luck with your future careers. And, I hope you have an amazing Valentine's Day together. I woke up this morning not expecting these to be posted already! I am crazy about every single one. You did an amazing job, we could have kept shooting for hours. Thank you so much for making Valentines Day so special for us! I love these! They are such a cute couple. These are some great pictures! It was great to see Alex and meet Olivia. They are a great couple, and I can tell they are very well matched for each other due to their interactions throughout the photo shoot. The pictures really demonstrate this well. The colors are great and capture the light, fun attitude that could be observed at the shoot. The smiles found in these pictures are genuine, which makes a world of difference! @ Olivia ~ I'm so glad I was able to surprise you this morning! It actually took everything I had not to post them last night, but I wanted to save your photos for a Valenine's morning surprise. You are very welcome! I am so happy that you like them! @ Kelli ~ They are adorable, aren't they?!?! @ Kevin ~ Thank you for the support, as always.